From the moment he came online, Clench was trouble. Created as a security bot, he completely trashed the Cyberfactory that gave him life a mere ten minutes earlier. Within days, he had gathered the disaffected and angry among the Earth-born Cybertronians and created the Decepticon Syndicate, crushing anything in his path. His sole motivation seems to be a seething core of universal hatred that fuels him more than any energon. He has no true designs for usurping Galvatron or Zarak, but figures, someday, they're going to get in his way... Even before the Forestonite experiment, Clench was a terrifying monster in battle. Now his nearly impenetratable armor and Colossus Cannons are augmented with the ability to create localized gravity wells up to ten times Earth's pull, leaving his targets utterly helpless before his wrath. Prelude: Most important thing first! Clench is the 1,000th figure to be reviewed on this site. Many, many thanks to all my faithful readers and my hard-working guest reviewers, who have made this possible and congratulations to Clench for capturing that coveted 1000th spot. And now, on with the show! Clench is a repaint (with a new head sculpt) of Universe Onslaught, so this review will focus mainly on the differences between the two figures. 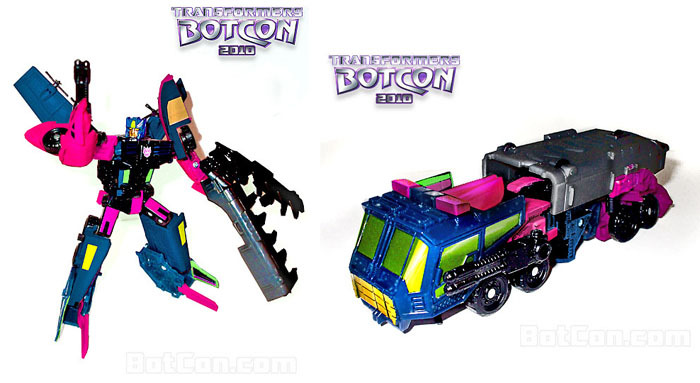 Btw, a faked image found on the Botcon site originally showed a Clench repaint of Universe Tankor. You can see the image here. Personally I’m glad we didn’t get that one. Robot Mode: As an Ultra-class figure, Clench is a massive robot that conveys strength and power quite well. The resemblance to the original G1 Clench is quite good, though the design of the figure differs quite a bit. But thanks to the superb new head sculpt and the choice of colors, the homage is clearly evident for everyone who’s seen (or owns) the rather obscure original. Small side note: The electronics built into the original Onslaught figure were removed for this Botcon release, but seeing as I’m not a big fan of light and sound effects to begin with, I barely noticed. 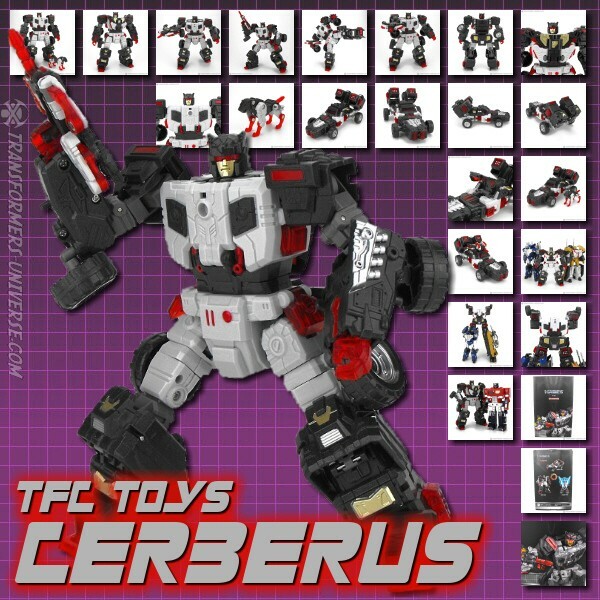 The main difference between the two figures is, of course, that the original Clench had a trailer section that converted into a big weapon platform (his only armament, btw), whereas the new Clench converts his entire vehicle form into a robot and carries his weapons with him, as well as that big shield with a nice big G2 Decepticon logo on it. Overall I must say that this mold seems custom-made for Clench (or at least a figure with Clench’s head sculpt), seeing as the bull-like noggin’ seems far more suited to the bulky, powerful figure than Onslaught’s rather non-descript features. So the bottom line here? A great-looking robot mode with no flaws worth mentioning. Alternate Mode: Just like Onslaught Clench transforms into a SWAT type tank vehicle. Except for the colors there are no changes here, so check out the Onslaught review for the full description of the vehicle mode. The resemblance to the original Clench’s vehicle mode is, of course, not all that great, but seeing as the emphasis was clearly the robot mode, that is quite forgivable. It does have that strange lightning-bolt/wolf emblem on the side that the original carried, too. Remarks: Now I know I’ve developed a bit of a pet peeve in regards to there being no actual G2 figures in the G2: Redux box set (at least none that actually debuted there). Clench here is a mixed case. Like many of the figures re-imagined for this set he made his debut not in G2, but rather in the twilight years of G1 (1991 through early 1993) when the series continued in Europe, but was already cancelled in the US. Now to be fair, Clench was in fact released as a G2 figure later on (but again, only in Europe), but under a different name: Colossus. I’m not sure why the Botcon people chose the G1 name instead of the one used in G2, but it might be because Clench was used previously in the IDW comics, namely the Megatron: Origins miniseries. Or maybe they just didn’t want any confusion with the X-Man of the same name. Who knows? The bottom line is: The Onslaught figure is a great mold and I have a huge soft spot for those European G1 figures (pretty much the only time we Europeans got something that was never available in America), so the combination of the two looks really good to me. Of course the price for this figure is hefty and the differences to the original aren’t that pronounced, so it’s definitely not for everyone (you can get Onslaught or the Hardhead repaint a lot cheaper), but for nuts like me, he’s a great catch.